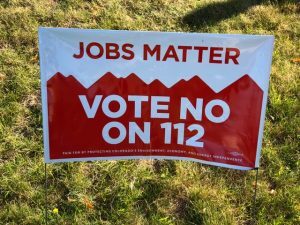 The five members of the Weld County Board of County Commissioners voted unanimously today to oppose Proposition 112, a proposed 2,500-foot setback on November’s ballot that they called a “dumb idea” and a “de facto ban” on oil and gas development. 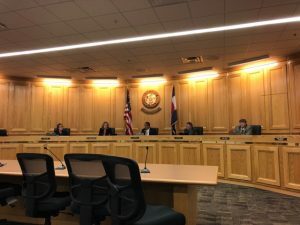 Weld County Chair Steve Moreno, Commissioner Sean Conway, Commissioner Pro-Tem Barbara Kirkmeyer, Commissioner Julie Cozad, and Commissioner Mike Freeman all gave full-throated support for the resolution introduced Monday. “[O]ut-of-state environmental activist groups are leading a campaign to ban oil and natural gas development in Colorado, showing a total disregard for the devastating economic impacts they will leave behind if they succeed, and Proposition 112 (“Setback Requirement for Oil and Gas Development”) is a one-size-fits-all, blunt instrument that would create a de facto ban on oil and gas production, even in communities that embrace responsible energy development, showing that the proponents of the Proposed Initiative do not support local control as they claim,” the resolution, obtained by Western Wire, read in part. Weld County is Colorado’s largest producing county, with more than 90 percent of the state’s oil production and nearly 40 percent of the state’s natural gas output, according to county statistics. A July Colorado Oil and Gas Conservation Commission study reported that more than 78 percent of Weld County would be barred from future oil and gas development, with 85 percent of non-federal land in the county off-limits. That figure prohibiting development—approximately 85 percent—also holds for the rest of the state’s non-federal lands. “You truly are the face of Colorado’s oil and gas industry,” Commissioner Conway said, thanking the standing-room-only crowd. “This will be devastating. I can’t think of a dumber idea,” Conway said. “Sometimes we forget when we use statistics and numbers as was so eloquently said here. 150,000 jobs—that’s 150,000 families, that’s real,” he continued. “Billions of dollars lost for education, and other vital services—first responders, public safety, this is real,” Conway said, detailing the hit to public safety services that would be felt immediately by residents should the proposition pass. “This is our fight. We didn’t come looking for it, but I think today, the folks who came up with this dumb idea 112, understand that they are messing with the wrong people,” he said. As Coordinator of Public Works in 2013, Conway described the nearly 170 roads, bridges, and other infrastructure that was damaged or washed away by the deluge that were repaired or replaced temporarily within 30 days, thanks to the diligent work from the oil and gas industry. The repairs came at a crucial time, as Weld County farmers began their harvest, he added. “The industry does care,” Conway concluded. District 2 Commissioner Cozad criticized the reasoning behind Prop 112. “It’s not even based on anything scientific. It’s just some random number that somebody came up with that thought it was a good number. And it’s really meant to be a ban, as other people have said, it’s meant to ban oil and gas in our state but primarily in our county which really concerns me,” she said. “[T]his is about people, this is about my neighbors, this is about people in my family, this is about my friends,” Cozad added. She pointed to the help from Noble Energy during the September 2013 floods, five years ago this week. “They were our heroes that day,” Cozad said, describing 12 truckloads of supplies provided by Noble employees who helped the Town of Milliken. She said she was proud of the work done by those in the energy industry, and proud to support them with her vote. But she also expressed deep frustration with supporters of the setback who say that workers can simply be retrained. “If this was about the environment or health or safety, that would be one thing. But it’s not. It’s about taking away all of your jobs. And that really upsets me,” Cozad said. Barbara Kirkmeyer, who represents Weld County District 3, said the industry’s willingness to step in at a moment’s notice with tremendous support and financial outreach in the 2013 flood was something she would never forget. Hher emails to oil and gas companies were immediately returned with offers of help and assistance, as Kirkmeyer sat in the emergency command center with communities in the county under water. “Within about an hour I had about $50,000 worth of gift cards committed. Within 24 hours, we had over $100,000 worth of gift cards committed, and we were working with United Way to ensure that we were able to get them up here and get them out to the folks that needed them,” Kirkmeyer said. Kirkmeyer said companies like Noble Energy and Anadarko basically adopted communities, providing immediate assistance. That effort, as floodwaters hit people who had only minutes to get out of their homes to safety, won’t soon be forgotten, she said. “The way that you all took care of your community in 2013 is amazing,” she added. Kirkmeyer called the 2,500-foot setback measure “reckless” because it ignores all the work that regulators and industry have undertaken for decades to provide safe, responsible development. “I can’t agree more with my fellow commissioners. This is real,” said Freeman, who represents District 1. “I think we need to pay attention to the unintended consequences. If this passes it will be devastating to K-12 education in this state, something that’s very near and dear to my heart. It will also be devastating to our fire districts, police districts—this is real,” he continued. Freeman called Prop 112 an attack on the county’s way of life. “This is something for the wrong reasons is out there. Oil and gas is more than just an industry, it’s a way of life in Weld County, it’s extremely important to the economy,” Freeman said. But Freeman cautioned that the passage of the setback would not harm just oil and gas producing counties—the whole state would face dire consequences. “As important as it is to Weld County, it will be even more devastating to the state of Colorado. If you think Colorado is in trouble today with its budget, not being able to build roads and take care of their infrastructure, if this passes not only will they lose the amount of money that is coming in, I believe it’s a takings issue,” said Freeman. He estimated that takings cases could cost Colorado billions due to lost mineral rights. Chairman Moreno said that the board’s support for the resolution was not a partisan move—the setback measure threatens all parties and all citizens, and transcends typical party lines. “This is not a political thing where it’s a Republican or Democrat thing. This is not about politics, Republicans versus Democrats,” Moreno said. Coloradans share common values, Moreno added. Moreno said he was “proud” to support the industry and to vote for the resolution.